A monthly Welsh language religious and literary periodical intended for the children of the Established Church. The periodical's main contents were articles on religion and the church's missionary work, stories, competitions, poetry and music. The periodical was edited by Canon Robert Camber-Williams (1860-1924) until 1921, by David John Jones until January 1931, and subsequently by Henry Jones. 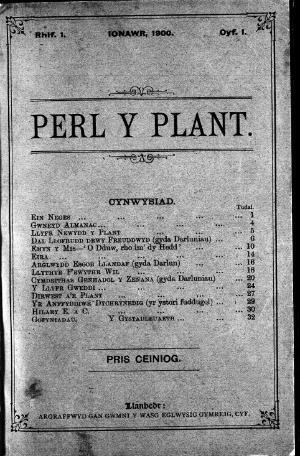 Associated titles: Perl Eifionydd (1901); Perl y Plant (Plwyf Llanllyfni) (1902); Y Perl: Cylchgrawn Misol Deoniaeth Llanbedr (1912).